Readers! 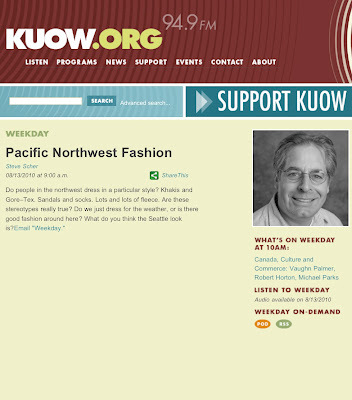 I am going to be part of a panel on KUOW's Weekday with Steve Scher this Friday morning from 9am-10am discussing Seattle fashion and how style has evolved in our city over the years. Strath Shephard from creative firm Pacific Standard and Adam Sinding from Le 21 Eme Arrondissement will also be part of the show as well as Laura Cassidy; style editor for Seattle Metropolitan Magazine and the mind behind fashion blog Wear What When. All three of these people are incredibly creative and talented so it should be a really fun conversation. You can listen on our local NPR station at 94.9 and also on Weekday's podcast if you are outside of the Seattle area.